The stories, ledgends and tales that are told through the years weave into the rich culture that shapes our American West. How times have changed! Today every TV station has a least two weathermen and every newscast has innumerable weather reports, usually given as fast as the tongues will move and repeating the same information ad infinitum. There was a time when this wasn't so. Back in 1950, TV stations were still unknown in Denver. KOA was probably the most influential of the radio stations. (KLZ was established two and a half years before KOA in 1922.) On New Year's Day, 1950, a slender young man arrived in town from Des Moines, Iowa: his name was Ed Bowman. Ed was born and raised on a farm in Iowa City. He loved weather and he loved to fly. Ed was convinced that in order to talk about weather, one should understand the sky, and flying was the way to do this. Ed had cut his broadcasting teeth with WHO in Des Moines (at the same time that Ronald Reagan was the station's sports announcer). In December 1950, Bowman managed to secure a reporting job in the newsroom for KOA Radio. On Columbus Day, 1952, KBTV (Channel 9) started to broadcast. The following June, KOA Radio was sold by NBC to Metropolitan Television Company, one of the principal stockholders being Bob Hope. That Christmas Eve, KOA radio became KOA-TV, or Channel 4, and for the next thirty years, those were the call letters of this station. if figuring out the next day's activity. This was the first time the term "trough aloft" was used to define weather. These hand-drawn maps have become collectors' items. Ed and his wife Madelyn lived with their family in Littleton. He flew his Fairchild trainer airplane every chance he got. One of his treasured possessions was a Norden bomb sight, a highly secret device used during the war, which he was able to purchase from the Air Force afterwards. During this time, before the Air Force Academy was completed, cadets were housed and trained at Lowry Field in Denver. One day, Ed lent two of the cadets his plane, to take for a flight "around the patch" south of the city. Something went wrong during the flight; the Fairchild crashed, and both men were killed. Ed never really got over the loss of these young men. storms, when driving to the studio in downtown Denver was treacherous. He related how once, when he overslept, there was no time to research the weather. So he hurried to the door, looked outside and found it was raining. He told his listeners that there was a 100% chance of rain ­ and he held his microphone to the door so that they could hear it pouring down! "Just listen to that!" he said. in Denver. For six months or so, we sponsored the weather report, which, though expensive, was great fun. Weatherman Bowman left Channel 4 TV in 1965, perhaps not entirely willingly. His fans felt that nobody else ever matched his skill. Ed continued reporting for some time, however, broadcasting for a Kansas radio network from his home studio. Ed Bowman died on July 4, 1994, and he was inducted into the Broadcast Pioneer Hall of Fame in 2001. The Hall of Fame, established by the Broadcast Professionals of Colorado in 1997, is dedicated to preserving Colorado's rich broadcasting heritage, and honoring those who had made significant contributions to this field. All of us have those wonderful people in our lives who quietly go about their daily activities without complaint. They don't stir up the wind or people's lives with grandiose actions. And at the same time, many of them have a great impact on us. Thankfully, I know one of those people. He is a son of Grand County who, like many of us, has a career that has taken him away from the place he loves. Luckily he has the opportunity to return many times a year to the family cabin. I want to share some of the things that I have learned from this man and his family: loyalty and dependability; love of family, county, country and the rural life; courage, humility and strength. These things make him a good man to know. I first met Fred Wood in 1967 when my brother married the eldest daughter of Fred and Mary Wood. It has been fascinating and rewarding to get to know Fred, his immediate family and extended family. The first thing I learned about Fred was his kindness and love of family. Almost immediately I was included in all family activities: the birthdays, anniversaries, and trips back to the family cabin near Williams Fork Reservoir. I was about the same age as his oldest sons and I suppose it was just easy for him to look at me as one of his boys. I was always extended a warm and sincere invitation to come to the annual summer and winter mountain events. We all had great fun, all fifteen to thirty of us. These events frequently pulled in the families of Fred's older brothers who worked the family ranches in the Williams Fork area. Loyalty and dependability are important to Fred. At the end of this year he will complete his 60th year working for the same employer. That is quite an accomplishment these days. He is always there training the new people and sharing his knowledge and work ethic. It says a lot about one's character to stick with something for that many years. Probably the most important accomplishments are the 59 years he has been married to his lovely wife, Mary, and raising their 10 children. Fred works for a moving company. This job requires a great deal of physical strength, much of which he gained working on the family ranch near Parshall, where he was born. I've witnessed his ability to do hard work when we cut trees for firewood, added to the cabin, or dug out the basement. Fred was born in 1924, the youngest of 13 children. Growing up in the 30's gave him a good understanding of the value of hard work and the determination to find a job to support a family. Like most of the people of his generation, the love of family and country put him on a path to service in World War II. It's only been in the last few years that I have learned about Fred's service and how much our country asked of those young people. Fred and his peers have shared some stories and now national authors have recognized the "greatest generation." You see, most of these people are modest and humble folks who were just asked to do a job and they went out and did it with no expectation of special recognition. Fred was a crewmember on a B-24 Liberator bomber flying out of England. These people understood the big picture and were sensitive, as illustrated by this quote from one of Fred's letters home: "I sure hope this thing comes to a close one of these days. It's too bad people can't realize just how pleasant things could be. Then maybe they could do a little more about it." I recently had the opportunity to fly in a renovated Liberator and I am amazed at what little the pilots had for protection. And that they were asked to do so much with so little. Another thing that you learn from these people is humility. The world that they saved us from was so brutal that they have kept it all to themselves for more than forty years. Now as time draws to a close on their times, the remaining crewmembers relish their annual get-togethers. They are always invited to share the cabin. For most of Fred's adult years he worked in Denver, away from his favorite place. But he shared his love of the rural life with his children, great-grandchildren and extended family. We have all been exposed to the ultimate mountain rule: there is always something to be done. Wood needs to be harvested for cold morning fires, the house and decks need to be painted to protect them from the harsh mountain weather, rooms need to be added for growing family and new friends. You can see where I am going. Here is a man who lived and worked through the country's most trying and challenging times. I can see his strength of character, dependability and devotion to family and friends. Make no mistake; he did not make this journey alone. Mary has been a partner from the first. They have shared the triumphs and tragedies together. And they continue to lead their family. It has been an honor for me to be part of this remarkable family lead by an unassuming, gentle man. I feel privileged to know this good man and to have him as a friend. “Blue” should have been a grouch, with a name like that. Nobody who knew him seems to know why he was called this; his real name was Rudolph O. Cogdell. If one went into his little grocery store in Fraser, although his voice was gruff, he gave a peasant greeting. He did possess a temper that could be ignited, and if his blood pressure rose, his face turned a brilliant red. However, he was kind to his wife, Gladys (Hunnicutt), a local girl, and loving to their daughter, Mary Ellen, who was a “late-comer” (Gladys was over 40 when the baby was born). On the store front, the sign read Codgell’s Market, which was located facing the highway near what is now Doc Susie Avenue. Before Blue bought the store in the mid-1940’s, he worked on the Fraser railroad section, and he also owned the Sinclair gas station at the corner of the highway and the main street, about 1940. Codgell’s Market was quite small, and the customer base was likewise, for there weren¹t many people in the valley in those days. Three grocery stores competed: R.L. Cogdell¹s Market, The Fraser Mercantile, owned by Frank Carlson, and the Red & White Store, run by Charles Bridge, Sr. There was also a tiny store by the sawmill near “Old Town” Winter Park; that one was operated by Mr. and Mrs. Green. The economy struggled for many years after the war, and everyone lived on a shoestring. Thus, prosperous times for any of the grocery stores had marginal potential. That should have made Blue grumpy, one might think. Blue, a short, rather stocky man with dark hair and brown eyes framed in glasses and habitually clad in his grocer’s apron, took care of everything in his mercantile except for the meat counter at the rear of the store. He would be found arranging the goods on shelves, dry goods on one side, dried food on the other, and fresh food in between. He stored some of the dried foods in barrels along the aisle. Fresh food was picked up once a week. It was, of course, very seasonal, with only root vegetables, apples, oranges, and bananas being available year-round. Granby Dairy delivered dairy products; Rube Strachman in Granby sold him meat. Nobel Mercantile from Denver serviced the dried foods and produce. Gladys, even shorter and stockier than Blue, had a fiery temper and she was known on occasion to retaliate if some customer gave her any lip. She was an expert butcher, and if a person wanted some special roast or other cut of meat, he went to see Gladys. She was good. Mary Ellen helped when she could, as she grew older. When the theater, located on the corner of Highway 40 and St. Louis Ave., or Main Street (now Eisenhower Drive) in Fraser closed its doors, Blue bought the building, doubling his available space. The layout was the same and Gladys still manned the butcher department at the rear of the store. Walking into the long skinny building always brought to mind the movies of previous days. The economy improved as the ski area grew. It was a fact that Blue, although a hard worker, also loved to gamble, and one report speaks of certain crap games. It seems that there was a stretch of track inside one of the tunnels in the Fraser Canyon that would rise with the frost every winter. When this happened, section hands from Fraser and Tabernash, including Blue in those days, had to go into the tunnel, removed the rails, dig out the hump, and replace the rails. While the men were at it, they would take time for those crap games. A good deal of gambling occurred at the Red & White Store too. Carlson, Cogdell, and Bridge often had poker games, where the losses were considerable on occasion. If he lost, did that make Blue blue? We don’t know. In any case, Blue and Gladys took separate vacations. Perhaps he went to gambling towns like Las Vegas; on the other hand, perhaps one of them just had to stay home and mind the store. Every Christmas season, Blue wandered over to the Fraser School to find out how many children were enrolled this year. It was Blue who furnished al the fruits, nuts, and candies for paper sacks to be given out to each child by Santa Claus at the end of the Christmas program. This was a town affair and nearly every person in town attended, sitting if there was room, standing against the walls of the gym if there wasn’t. Nobody cared to miss the play and singing performed by every single child in the school. PTA mothers filled the goody bags. Few people were aware of Blue’s generosity. Article contributed by Jean Miller So many people ask if it is true that winters used to be much colder up here. The answer is yes. We could generally figure on one to two weeks of nights between minus 30 degrees to minus 50. This usually occurred between the middle of November and the third week of January. (Please note that we also didn¹t have pine beetle infestations during those years.) We Fraser Valley folk depended on weather reports kept by Ronald and Edna Tucker, who for many years faithfully read thermometers day and night. It was through their efforts that Fraser came to be known as the “Icebox of the Nation”. These were the years when it was guaranteed that the power would go out, usually on the coldest nights when you had a crowd in the house, for the REA had not existed very long and they suffered from many glitches and equipment failures. Occasionally somebody would set his house afire, trying to thaw pipes entering from the outside. The incident I am going to relate was in mid-November 1951, and I had just delivered Dwight to the airport, to leave for his required two weeks Naval Reserve active duty in San Diego. I took advantage of the break to stay with my family in Denver for the night. I was an innocent city girl, and at that time I didn’t realize the connection between being overcast for a week (which we had been) and what happens when the sky clears (which it did). I got home to Hideaway Park in the late afternoon, just after dark. It was so cold! I checked the house and put more coal in the stoker. All was in order. Next I went over to the Inn (Millers Idlewild). As I opened the front door, I heard water running, as in a waterfall. The noise came from the kitchen. When I went to check, I saw a spray of water shooting from the sink all the way across the room, drenching the stove. The floor was an ice skating rink. I couldn’t believe my eyes. As far as I could tell, it was as cold inside as out. I tried to shut off the water at the sink, but the pipe was split. I ran to the laundry room and searched for valves, but everything I tried did nothing at all. At last I drove back to the highway to Ray Hildebrand’s house. He and his wife Mabel had a small grocery store and Hideaway Park’s first post office. Ray, one of the few people I knew in town, kindly came to my rescue. He found the main valve hiding behind other pipes, and the geyser in the kitchen fell silent. Then I built a fire in the furnace. Now I was a poor ignorant city girl. For years my family had had natural gas; when it got cold, we turned up the thermostat. What did I know about stokers, sheared pins, and augers, tuyeres and clinkers? A lot of nothing. That was a rough two weeks. The night temperature was never warmer than 35 below. I mopped up the mess in the kitchen, once the place warmed up a bit and the water thawed, but I just left the split pipe situation for Dwight to deal with. I struggled the whole time to keep the Inn above freezing. I was afraid that if I gave up, every pipe in the place would burst and I was embarrassed to call on Ray Hildebrand again. Dwight’s weeks were finally over and I picked him up once more. I was so glad to see him! Indeed, I hoped he wouldn’t leave again for a very long time. He was a dear boy and I did miss him. Besides, he knew all about pipes and pumps and furnaces. Jimmy and Maggie Crawford settled in Hot Sulphur Springs in June of 1874. They left their farm in Missouri with their three children, John not yet two, Logan 4 and Lulie 7 years old to begin a new life in Colorado. The one room cabin was built of round logs and had a sod roof. In several places outside light could be seen between the logs. The floor was packed earth covered with elk skins which had a tendency to smell while drying out after a rain or melting snow. The sod roof was far from water proof. When the children came down with scarlet fever Jimmy promised to cover the roof with wood shingles and had gone to Billy Cozens' sawmill to make them. Mr. Cozens was very helpful and even gave Jimmy a rusty iron stove to take back home. Rusty or not, to Maggie it was like new. She was most appreciative. The shingles were carefully stacked by the cabin but never made it to the roof. Jimmy carefully explored the area for suitable pasture land for his small cattle herd. His explorations took him further and further to the west of Hot Sulphur Springs and as fall approached he became desperate to locate suitable grazing pasture before the snows. Although Jimmy would return home every few weeks, the time in between his visits became longer and longer as he moved his cows to the west. Maggie was faced with many hardships in his absence. Ute Indians would quietly appear, seemingly from nowhere, and ask for food or as in one instance, ask to trade a pony for the little boy John which she of course adamantly refused. Maggie was able to keep friendly relations with the Utes but never comfortable when they appeared. The conversations were limited to jesters, hand language and a variety of facial expressions. But this is a Christmas Story. To begin with, mountain men, prospectors and just plain loafers from Georgetown would stop by the Crawford's for a meal when they were in the area. Maggie would never refuse them. A few weeks before Christmas four prospectors enjoyed a well prepared venison stew with Maggie and the three children. Lulie, the seven year old told the visitors how she was going to hang a stocking at the foot of the bed for Santa Claus to fill with toys and candy. Her two brothers shook their heads in agreement. Maggie said, "Lulie, I really don't think Santa Claus could find us way out here in Colorado!" She knew there was nothing she had to fill the stockings except maybe some sugar candy which would likely be a disappointment for each of them. Their Christmases in Missouri were memorable with presents, candies and fruit. One of the four prospectors listened intently to Lulie as she described the Crawford's last Christmas in Missouri. He had introduced himself as Charley Royer. Charley was a 22 year old, recently from Kentucky now working in the silver mines near Georgetown. After a very satisfying lunch the men left and a heavy snow began to fall. By Christmas Eve the snow was deep and drifts were high. The temperature dropped below zero. Although Jimmy had promised to be back for Christmas, Maggie thought the snow too deep for him to travel. He had located what he called the perfect pasture far to the west and had made a land claim close to a bubbling sulphur spring. He told Maggie it reminded him of the sounds steamboats made on the Missouri River and named his land claim, "Steamboat Springs." Alone with the children, Maggie read the bible story of Christmas. Before dropping off to sleep, Lulie said, "I know Santa Claus will find us, I just know he will!" Maggie sadly shook her head. Hours later, close to midnight, there was a gentle knock on the door. Maggie cautiously opened the door hoping it would not invite trouble. To her surprise it was the young Charley Royer. He held out a gunny sack and said, "Mam, I've brought some oranges, hope they haven't froze, some candy and a few toys for the children. Please tell them Santa Claus did know where they lived. I remember how important Christmas was for me and I wish you and your family a Happy Christmas." He turned and walked back into the darkness. Charley Royer had come 60 miles from Georgetown in the bitter cold and heavy snow to make three little children happy on Christmas morning with oranges no less, in the middle of winter, toys and candy, a Christmas they would never forget. Jimmy made it home on Christmas day to add to the joy. The following year and many years after the Crawfords had Christmas in a comfortable ranch house in a place called "Steamboat Springs." As for what the future held for Charley Royer, well that's a story for another time. Article contributed by Jean Miller Ed stood, ramrod straight, in front of his tiny green house, checking out the day: sky­ clear blue; clouds ­ soft and fluffy; wind ­just a light breeze that gently lifted his thin white hair; Brown’s cow feeding in Millers’ yard, as usual; Old Lady “Ada” (aka, Mrs. Zeida) getting ready to water her Oriental poppies. The day was on its way. “Ha! Here comes Dwight to chase off that darned cow. He goes through this every day. I bet one of these days he’ll have fresh cow meat for supper!” Ed returned inside his cabin, to feed the stove and make coffee. The fact was he didn’t need any more heat. He kept the place about 85 degrees, summer and winter. But Ed was so thin, cold went through his worn body easily. Soon he poured himself some coffee and went out to talk to Mrs. “Ada”. “Hello there, old woman. Those poppies are the prettiest you you’ve had for years. You should win a prize.” “Thanks, Ed. I agree that they’re especially nice this summer. Brown’s cow has left them alone for a change.” With a laugh, she went back in her house. Dwight Miller wandered over to chat. “Mornin’, Ed. How’re things?” “Well, just fine, except you’ve got to tell your cabin guests to quite using my outhouse! I saw three of them coming out of there early this morning. Tell them to use their own! I’m going to build me a fence.” Dwight looked apologetic. “Boy, Ed, I’m so sorry. You know, sometimes they just can’t wait, so they invade ours. But I tell you what, I’m going to put in a regular bathroom at the back of my garage, facing the cabins. I hope, at least, that will take care of the problem. In fact, if you want, I’ll give you a hand on your fence. I don’t blame you for being irritated!” Ed was mollified with this offer. He had lived in his cabin for some years now, after finishing up his days as a tunnel worker in 1927. He used to tell Dwight, “Back then, there were prostitutes behind every tree up near the tunnel, and if you paid them a quarter, they’d give you 15 cents change!” He was Austrian and had served many years in the Austrian army, but he got fed up with all that and came to Colorado to live. The mountains reminded him of his home country, and his life style remained just as spare and regimented as it had been in the army. Everything was neat as a pin. The old man kept track of his neighbors’ comings and goings, including Dwight’s wife, Jean, and their toddler, Martha. He used to really fuss at Jean, because she insisted on whistling. “Jean, ladies don’t whistle!” But Jean liked to whistle, so she continued not being a lady. The baby was another subject. Dwight had built a ladder coming down from their apartment on the upper floor, as a second exit in case of fire. Martha learned to climb down that ladder before she was three years old. “Dwight,” Ed would protest, “that baby is going to kill herself! She¹s going to fall; then where will you be?” But Martha seemed to do just fine with her climbing and she never did kill herself! One day Dwight bought a small Army surplus life raft. Opening it, he discovered some dye, to be dumped into the ocean so that planes could spot men in the water. “Hm-m,” he thought, “I wonder if this dye really works?” So he went up to the bridge over Vasquez Creek and poured some dye into the water. Yes, indeed, it worked. The bright red color spread into a great circle in the creek and promptly flowed downstream. Dwight hightailed it down to his house, to see if the color still held. Here it came, and here came Ed Vucich, madder than a hornet. He had spotted the dye and was quite positive that Dwight was trying to poison him and all the others who used the creek water for drinking. In spite for fretting and stewing over illegal outhouse use, “poisoned” water, babies on ladders, and unladylike whistling, Ed cared for the young couple. On day as Dwight and Jean were about to head into Denver, he came rushing out and stopped them. “Here, I have something for you!” And he presented two beautifully baked potatoes, straight out of his oven. They were perfectly lovely. Ed swore up and down that he didn’t drink, but in fact, he was known to visit Wally’s Bar on the highway into town. One bitterly cold night, Dwight and Jean heard a rumpus going on outside. In those days, winter temperatures dropped regularly to minus 40 to minus 50 degrees. Getting out of bed, the pair went to look out their front window. Ed was attempting to get into his house, which he kept locked with three different padlocks (why was a mystery; he had very few belongings). Perhaps he wasn’t drinking, but he certainly wasn’t sober. He tried to open a lock; his feet slid out from under him and he swore, “Damn!” He struggled back onto his feet again. Same result. The young people didn’t dare just leave him, hoping he would finally get into his house he’d have frozen to death. But if they had interfered, oh, he would have been furious. So they watched until at last all three padlocks were open and the old man staggered inside. They never told him about the show he put on! Ed lived in Hideaway Park for a number of years longer, but it’s uncertain as to where he is buried. Dwight is convinced there probably aren’t as many characters in the valley as there were fifty some years ago. January, 1911. Five years ago they were teenagers in Torsby, Sweden, oblivious to the sweeping changes that history and hope would bring to their lives. Now they’re in a mountain valley halfway around the world from their Scandinavian homeland, marveling at the tiny bundle of flesh and spirit who has just joined their family. It’s the coldest week of the year in one of the coldest spots in America, but there’s a fire crackling in the woodstove, and their hearts are warm with love for each other and their firstborn child. For the next few days, a parade of fellow Swedes stop by to pay their respects to the newest resident of the town of Fraser: Elsie Josephine Goranson. February, 1918. It’s barely dawn, and a blizzard is howling across the valley, piling snow against the sturdy wooden house. George Goranson puts on his boots and woolen overcoat and trudges towards the barn. There are cows to milk and horses to feed. There are no days off. Meanwhile, in the house, 7-year old Elsie stokes the perpetual fire in the cook stove, while her mother grinds the beans for a second pot of strong coffee. Later they will make sour cream cookies. Her younger brother Hill is sick in bed with influenza. He will survive. Many others will not. March, 1925. The logging camps are humming, the Moffat Tunnel is under construction, and the valley is brimming with workers and their hard earned pay. Fraser merchants and boarding houses are doing a brisk business, as are the local bootleggers. Elsie is waiting tables at the “Victory Café”, named for its proximity to the new coast-to-coast “Victory Highway” that passes through town, and each morning she serves breakfast to the nice looking (if scantily clad) girls from the corner house of ill repute. Soon the local vigilante committee will force these ladies of the night to leave town, but for now it’s business as usual, and Fraser is hopping. In fact, “Russell’s Riot Squad” is playing at a dance tonight at the Thomas Hotel. April, 1927. Sleigh bells jangle as a team of horses pulls four young couples down valley to a dance in Tabernash, the most happening town in the county. The roundhouse is there, as are the wages of engineers and brakemen who guide the trains over Rollins Pass. There is even a movie house, where Elsie saw her first moving picture, “Jackie Coogan”. As the sleigh glides across the moonlit snow, Elsie feels a mix of excitement and nervousness. This is her first date with Chuck Clayton, a hardworking man from Oklahoma. Chuck is handsome as he steals glances through the cold night air, but her Dad doesn’t approve of his drinking and gambling. Other dates will follow: motor trips in a Model A Roadster to Garden of the Gods, picnics in Rocky Mountain National Park, and plenty of dancing. “I’ll never marry you,” she tells him everyday. “Yes you will,” he insists. May, 1933. One child underfoot and another in the belly, and Elsie Clayton is tired. Chuck bought a house for 20 dollars and used the lumber to build a hamburger stand (soon café and bar) right along the newly paved Highway 40, the main route from Denver to San Francisco. For the next 38 years, their lives will be a blur of ham and eggs, New Year’s Eve parties, and a long medley of songs on the jukebox. The school bus will stop there, as will the “Steamboat Stagecoach” bus line, and three generations of folks looking for a home cooked meal or glass of beer. There will be marathon cribbage games, war stories, and “Friday Night Fights” watched live on the first television in town. Despite the booze and boxing, Clayton’s Café and Bar will be known as a family establishment, especially compared to the “Fraser Bar”, a.k.a. the “Bloody Bucket”, where a love triangle will one day lead to murder. June, 1945. It’s 4:30 a.m. Elsie tiptoes downstairs and into the café. She brews coffee, warms up the grill, then sits and enjoys a rare moment of relaxation before her workday begins. In the distance, a steam locomotive blows its whistle as it chugs towards town. Before her life is over, nearly a half million trains will pass through Fraser, an endless stream of rumbling horsepower that conjures up different images as the years pass by: trains bringing home soldiers from the Great War; trains loading up ranchers’ fattened cattle in the fall; trains delivering newspapers and mail; trains colliding head on in the Fraser flats; a train’s whistle frantically blowing to alert sleeping townspeople to a midnight fire; streamlined diesel trains ushering in a new era, and countless coal trains, hauling the carbon wealth of Western Colorado to the factories and power plants of far off cities. July, 1950. Summer’s here, and all are invited to the town picnic down by the Fraser River. Aging Swedish bachelors will be there, sipping steel cans of Coors and swapping stories of crosscut saws and the rowdy “Lapland” logging camps up St. Louis Creek. Young men will dance with young women. Young men will start fistfights with other young men. Navajo railroad workers will perform a rain dance. Children will play Audie Murphy in the riverside willows and drink Coca Cola from thick glass bottles. Meanwhile, the deluxe brick barbecue will sizzle as Elsie spreads mayonnaise on buns and Chuck flips burgers and jokes with friends. August, 1953. President Dwight D. Eisenhower is coming to town to fish and relax. “We come Ike” banners wave in the breeze as the motorcade turns off Highway 40 and onto the dusty gravel of Main Street. Cheers erupt and flashbulbs pop as a smiling Ike emerges from his limo and waves to the crowd of 300. It is the biggest day in Fraser history, but Elsie sees none of it, for even as her husband, the Mayor of Fraser, is welcoming the leader of the free world to town, she’s in the cafe tending to the crush of reporters and tourists who’ve come to see an American hero. Tomorrow, after the excitement dies down, she’ll personally deliver two of her homemade pies to the President, who will rave about the perfect crust. September, 1971. Retired. Chuck and Elsie sit on the porch of their new home on the edge of town, watching cows graze just beyond the fence, and taking in the unobstructed view of Byers Peak. Labor Day has come and gone, and now town is peaceful, the highway quiet. Freed from the busy schedule she’s kept for decades, Elsie will soon embark on a reading frenzy and will begin to keep a modest journal of the days’ events: A Grandchild born, an illness in the family, an exceptionally cold morning. Chuck busies himself planting trees, tending a garden, and mowing his spacious lawn. Tomorrow they will pack a picnic lunch and drive the Denver Water Board roads in search of raspberry bushes. October, 1978. Today is Chuck and Elsie’s 50th wedding anniversary. It’s a perfect day, sunny and warm, Indian summer if there ever was such a thing. The mountains shimmer beneath a blanket of fresh snow. Hay meadows glow golden beneath the cloudless sky. Family and friends gather in the yard for photos before heading to the Crooked Creek Saloon, formerly Clayton’s Cafe and Bar, for a long afternoon of celebration and reminiscing. November, 1999. After 71 years of marriage, Chuck has passed on, and Elsie is suddenly alone. She sits at her dining room table, peering out the frost fringed window at the town she was born in, the town she has lived in her whole life. The ridge she once sledded down is covered with condominiums. The willowed wetland where her brother trapped muskrats has become a large parking lot. Her father’s horse pasture is now a shopping center. Everything has changed, yet memories remain, taking on a life of their own. Horses still pull wagonloads of hay up the highway. Loggers come in from the woods every Saturday night for revelry and roulette. A young couple poses for a photo in front of their new cafe. A sharp axe splits a chunk of pine. Life goes on. December, 2004. Christmas Eve. There is plenty of food, including the homemade potato sausage that’s been served at every family Christmas for centuries, and plenty of gifts stacked beneath the brightly lit tree. Elsie sits at the head of the table, quietly marveling at this clan she has wrought. Her surviving children are here, as are her grandchildren, some of who have grandchildren of their own. Five generations of family pour gravy on potatoes and crack jokes. As she looks at their faces, she remembers her own parents, her grandparents, and her husband. Everyone is here. In a few minutes, in a ritual as old as Elsie can remember, her great-great grandkids will hand out presents, and the house will resound with laughter. Article contributed by Jean Miller Bill Cullen moved to Hideaway Park from Berthoud Falls in 1961, at which time he bought several pieces of property. One was the filling station and the Village Inn, priced at $25,500, belonging to Wally and Dottie Tunstead, who had come to town right after the war. The Tunsteads moved back to Oklahoma, their former home. Behind Tunsteads’ stood a very small, old house, on land possessed by Easy Butler; Bill bought this too, in 1963, as well as a house near Vasquez Creek, owned by an old-timer, Charlie Tigges. Next he bought old Mrs. Zeida’s house; she had died in 1964, and when her son Joe came to clear it out, Bill hightailed it over to see him. “I’d like to buy your place. Would you be interested?” Joe was definitely interested, so the two came to an agreement on the price: $100 down and $50/month. Adjacent to this was land belonging to Marie Roth, which Bill had already bought, and the Roth/Zeida properties formed the nucleus of Bill’s “homestead.” One of his first projects was to put in an access drive to the house, for there was none. Few of these people drove, you see. Almost immediately Bill discovered that there was a huge rock in the way, one which wasn’t going to be moved with just a pick and shovel. Wandering over to see his friend, Dwight Miller, he inquired, “Did you by chance have any dynamite left over after blasting those beaver dams the other day?” “Why, as a matter of fact, I did,” answered Dwight. “What do you need?” Thus it was arranged for Dwight to come blast that rock out of there. Now Bill’s driveway was to be built along the very edge of his property, which also happened to be very close to the home of Mrs. Hart, who lived with her son, Ken, and his children, Beverly and Danny. Bill and the Harts always had a running battle going. He had gotten cross-wise with Ken, when he blacktopped the road in front of the Village Inn filling station, thinking to make it easier for customers. Because Bill and Dwight were friends, by extension, Dwight was also Mrs. Hart’s enemy. Mrs. Hart was a crusty old gal and when she saw that something was a-foot, she hustled out to protest. “You two’ll have holes knocked in the roof of my house with all that blasting! You can’t do it.” Bill thought a moment. “I see your point, Mrs. Hart. I tell you what. I know where there’s an old mattress. We can put that over the rock and it will contain the sound as well as odd rocks that might go flying.” So Bill and Dwight headed down to the little house behind the Village Inn. It seemed that some fellow was renting it from Bill and he hadn’t bothered to pay his rent, minimal as it was, for at least four months! Without a qualm, the friends brought back a rather ratty mattress that would do the trick perfectly. Dwight dug down next to the rock and carefully stuck his sticks of dynamite around it. They laid the mattress over the top and placed the fuse leading away from the rock. Mrs. Hart stood, glaring at them from inside her house. The moment had come. Dwight lit the fuse and the two men ran off to a safe distance. A few moments later --- KABOOM! Dwight and Bill saw the mattress rise and rise, higher and higher, up to the very tops of the nearby pines. They heard the rattle and clatter of small rocks tumbling and skittering off Mrs. Hart’s roof. They watched that furious old woman rush from her house with fire in her eyes, almost before the mattress had a chance to make a safe landing. She was ready to tear them limb from limb! But they checked her roof, and amazingly there was no damage at all. What a bit of good fortune. They inspected the rock and found that it had shattered beautifully! Bill would have no problem at all in building his road now. Dwight did earn from this project, however, that there were some things he didn¹t know about blasting rocks! As for the mattress, they searched for it. I can assure you that that mattress was never going to look the same again. Off to the dump it went, at least those parts of it that could be found! Article contributed by Jean Miller The Middle Park High School band wasn’t much to brag about, and that’s a fact. Several members were very capable young musicians, however. For instance, Stuart played a hot set of drums that set people’s feet to tapping and hands to clapping. Debbie was an excellent trombonist, good enough so that one year, she was invited to march with Pierre Laval’s All American High School Band in the Rose Parade! And Jack was right behind her in skill. Martha led the flutes beautifully, and there were Alan, Bert, Roxanne, Carolyn, and others. But the group never seemed to coalesce into a single playing unit. Then a Music Man came to the school. Wes Robbins was a showman; he was enthusiastic; he had flare; he had color. He took those young people in hand and soon had them marching in time down the same street. People flocked to hear the music, whereas before, they just groaned. By the end of the school year, Mr. Robbins decided that the band needed uniforms, sharp uniforms to match the cool music. Now most of the extra-curricular funds went into sports, particularly football. But the band leader convinced the administration that with uniforms, the band would rouse the fans to a high pitch, encourage parents and family to attend games, incite the teams to greater, and winning, efforts. So he got the uniforms. That fall the band players tingled with excitement as they waited to try on their new duds. They looked wonderful. All the effort was worthwhile. But Mr. Robbins didn¹t stop there. Every spring, on the first weekend of May, Canon City held a Blossom Festival. Bands from all over the region came to march and compete. The Middle Park Band proposed to join this event! You must understand, there were only forty students in the band, for this was a small district still. When the youngsters arrived in Canon City, they met bands from Texas, Oklahoma, Kansas, and Nebraska, as well as from New Mexico and numerous Colorado schools. Many of these bands had 100 to 120 or so members! All were much larger than our little group. The Middle Park students felt rather overwhelmed. But it wasn’t long before the big bands had adopted this nifty minuscule band as a mascot. Saturday came and the bands lined up at the foot of the Canon City prison wall. Just then, two inmates jumped from the top of the wall, presumably planning to escape into the mob of students and onlookers. Prison guards shot the men dead in the air. This rather rocky start for the event didn’t phase the boys and girls; the parade commenced. Grand County enthusiasts lined the edge of the avenue as the bands marched down, drums beating, horns tooting, and music filling the air. “But where is our own band?” they wondered. Suddenly, applause erupted and you could see why. A Nebraska band of some 120 members filled the street. Shortly after, striding bravely along, a compact band of forty students in spiffy navy blue uniforms, played beautifully and vigorously. Following behind them was another band of over 100 members. The contrast was astounding and people loved it! Clapping onlookers whistled and shouted. That afternoon the many groups competed on the football field, doing intricate formations as they played their music. Middle Park picked up two first place ratings for their performance that day. That was truly a triumph for our musicians, as they realized that even though they were small, they were mighty. This must have been about 1971. Welcome to Middle Park and Grand County! Joseph Wescott was born in 1838 in Nova Scotia and reared in Iowa. By 1865, he was in Middle Park, squatting, half-blind and semi-alcoholic, in Hot Sulphur Springs with his friend Charlie Utter. Having come to Colorado to get relief from rheumatism, he passed his time in creative writing, fishing, drinking, and shooting his revolver. In 1868, after being induced to sell all of his claims of 160 acres around the hot springs, he left Hot Sulphur Springs to go to Grand Lake. In 1870, a group of Arapahoe Indians arrived in the area and there is an unverified report that Wescott, Jack Sumner, and three fishermen killed “not less than five” of the Indians. Soon after this incident, Wescott settled into developing a rustic resort with cabins, rafts, canoes, and skiffs on Grand Lake. By 1879, he had three buildings on the West Shore. In July 1880, disaster struck when Edward Phillips Weber, an attorney, took over Wescott’s original filing as his own. Weber claimed that there were “flaws in the filing” and forced Wescott out. Nevertheless, on June 26, 1888, Wescott filed a plat for “Grand Lake City,” on the lake shore south from the inlet. He designed the area for summer visitors rather than as a residential community. Wescott later wrote a famous poem about the legend of Grand Lake, and how the spirits of the lost Ute women and children can still be heard wailing on foggy mornings at the lake shore. Lillian Russell Smith Wood was born in Dunlap, Kansas, in 1884, she was not a particularly healthy child. Born just before her and just after her were sets of twins, 2 of the 4 sets born to her parents and the only 2 sets that survived into adulthood. Lillian spent her adult years on the Williams Fork and then in Parshall. Known as “Gram” Wood to most everyone who knew her, she was grandmother to 39 who bear the names Wood, Noell, Stack, and Black. And her history in Grand County beginning in 1905 made her one of our pioneers. In the fall of 1905, the local newspapers report that Herb Wood had lost a large portion of his right hand in an ore crusher accident. Herb had come into Summit County originally with a mule team for “Uncle Joe” Coberly, another Williams Fork resident and apparently worked in or around mines and mining equipment while also hauling the timbers for mine use. Herb needed some round the clock nursing, and in those days, for Gram to take proper care of him and still be in an acceptable position, they needed to be married. One source says the situation was so different that a Denver newspaper picked up the story with a headline of “Loses Three Fingers, Wins a Bride”, indicating that they married 3 days after they met. Research has never turned up a trace of that story, and it’s unlikely in the mining camps in the area that they hadn’t met until he was injured. Still, they were married by Judge Swisher, well known area businessman, in short order in the hotel room where Herb was recovering . A short time later they made a brief wedding trip to Denver and then returned to Argentine. Before fall set in that year, the newly married couple moved to the Little Muddy. Herb had been sending money to a partner who was helping him to secure a homestead there not far from where Joe Coberly lived. It was probably with anticipation of a great future on their own land that sent them into Middle Park to face their first winter as a couple without having had a chance to raise a garden or preserve any winter supplies. They moved into one end of a two room cabin with a man named Ranger Charlie in the other. And about that same time, they discovered that Herb’s partner had been drinking the money he’d sent over the years. What devastation that must have caused! On the other side of the valley just across the creek was the large ranching operation known as the Hermosa Ranch, owned by Dr. T. F. DeWitt, a well-to-do doctor from back East. With the dream of his homestead gone, Herb went to work for DeWitt, eventually becoming one of his foremen. Gram probably helped out with cooking and cleaning, but within a few months, she went back to Kansas to await the birth of their first child. Over the next 21 years, she raised kids and gardens and developed her love of fishing, which helped feed a family that eventually totaled 13 kids, including a set of twins born 2 weeks before Christmas and delivered by Herb when a doctor couldn’t reach them in time. Pictures of the time show a large family of 9 boys and 4 girls with Gram, all 5’2” and maybe 100 pounds of her on one end, and Herb with a child or two on his lap at the other. The kids recall Christmases being supplied mostly by Mrs. DeWitt and sometimes being late if the trains got snowed out of the area. All attended one room schools, Hermosa and Columbine, and stories of their lives together can make one wonder why any of them survived. Life continued pretty much routinely until 1928. That summer, the youngest daughter, Marilyn, a premature baby and ailing child caught whooping cough. She lingered and languished until early October, and then she passed away. The close-knit family had suffered it’s first loss. Two weeks later, Herb came in from the hayfield complaining of not feeling well. Gram followed him into the living room and sat down with him on the couch. Minutes later, he collapsed in her arms and died of a cerebral hemorrhage. They buried him alongside Marilyn in the Hot Sulphur Springs Cemetery. The boys continued the work for Dr. DeWitt for several years, and in 1932, they built a 2 bedroom house for Gram several miles from where DeWitt had relocated his ranch. Her sons made sure she had what she needed as she finished raising the youngest ones who had been little more than toddlers when Herb died. By the time I was old enough to remember much about Gram, she was already a “little old lady” who lived in a small, pink mobile home next to Uncle Kenneth in Parshall. Everyone knew that she was one of the best fishermen in the country, having caught as many as 1200 in a season when she was feeding her family by herself. She enjoyed creek fishing the most, and even as she got older her ability to maneuver around the biggest holes and catch fish in any small body of water never faltered. I never saw her get wet. In the winter, she was totally unafraid getting a couple of her grandkids on a sled and making a run down the hill in Parshall that ended at the store and U.S. 40, which then went through the center of town. Had her feet not worked so well as brakes, we could have ended up on the pavement. But we never did. She must have driven many teams of horses in her day, and I believe she was a good rider. She never drove a car, but unless she needed to go to the doctor in Kremmling, she didn’t need to leave town. Her friends included Doc Ceriani’s mother and fellow fishermen from Hot Sulphur, a couple from Poland with heavy accents. Somehow, somewhere she had met Ralph Moody, author of the “Little Britches” series. And she, too, had a “fish” experience with warden Henry “Rooster” Wilson. Only once did I get into trouble because of Gram. She was fishing one day near where I was getting ready to ride, when she laid down her pole and walked over to me. After watching me for a minute she said, “Can I ride?” What do you say to your 80 year old grandmother but, “Of course!” I saddled up the gentlest mare we had and helped her aboard. She only made a couple of trips around the small pasture, but as she rode, walking only, I’m sure I saw a young woman next to her husband on horseback in front of one of the Hermosa’s big barns. It’s one of the pictures you’ll find at the County Museum in Hot Sulphur. When dad found out what I’d done, he turned deathly white. “Don’t you know if she’d fallen or been thrown she could have been seriously injured or killed?” No, I had to admit. This was one rider’s request to another, with age no consideration . And to her at that particular moment, had either occurred I believe she would have considered those few moments worth the risk. When she was finished, she walked back to her fishing pole, satisfied that nowshe was done riding. Gram introduced me to horehound candy, something I will also think about each time I taste it. And because she didn’t like my first name, I didn’t even know what it was until I started school. She taught me that barn cats do fish and that survival in a small living space was possible The one thing she didn’t teach me was anything about her growing up years or about my grandfather. It seemed like we knew as very young kids that we didn’t ask about him. I believe that hers was a love so strong that even to the point where her mind grew dim, the pain of losing him was too much to bear. One regret we all have, however, is that we never asked to her to go with us up to Summit County to show us where she lived and to tell us stories of that life and time. And unfortunately that’s been lost forever. Gram passed away in 1980, at the age of 97. She is buried with Marilyn and Herb and their son, Melvin who died during World War II in a family plot in Hot Sulphur with other family and pioneers characters nearby. She left a true legacy through her kids and grandkids who continue the nostalgic traditions of their beloved Gram. From his earliest memories, Mike Norton recalls playing with model ships and submarines with his older brother. His older brother had a ship, and he had the sub. The small pond on the Circle H ranch where he spent his early life before Lake Granby filled up gave little boys' imaginations an ocean. Marbles gave them depth charges. "But I could never find a way to shoot marbles from the sub," Norton laughingly remembers. As the water literally rose above his home, it shaped his life. The history of Lake Granby and the Norton Marina goes as deep as the water, literally. Grand County's pioneer ranching history lurks at the lake's bottom, sharing its place with rainbow trout amid the vast water supply for eastern Colorado and beyond. Before the lake filled up as part of the Colorado Big Thompson project, ranches like the Lehmans, Knights and Harveys had been stage stops, cattle and dude ranches and even an airstrip used by Charles Lindbergh. Mike's dad Frank came to Grand County to ranch. "All I ever really wanted to do first was to be a rancher here," Frank Norton told the Sky-Hi News back in 1997. At fifteen or sixteen years old, Frank Norton in a Model T Roadster traveled from Okmulgee, Oklahoma to Grand County, where he "fell in love" with the ranch that his mother and step-father started around 1930. The Circle H, started by his step-father Jim Harvey in the valley that is now Lake Granby, became his summer home. By all accounts, Frank Norton loved ranching. The Circle H "was a working ranch and a dude ranch." Harvey's ranch provided a spectacular backdrop highlighted by the Indian Peaks, reaching 13,000 ft high along the Continental Divide. The Circle H offered a caricature map for tourists looking for a real western experience. It led them over Berthoud Pass along hwy 40 to hwy 34 and then right at the Circle H sign to the Ranch. Leaving on horses from the Circle H, Frank Norton and Jim Harvey took them into a vast and remarkable country that, for the most part, can only be reached on foot today. In those days, the area now protected as the Indian Peaks Wilderness Area faced less threats from overuse. Ranchers hunted the region to supplement the sometimes skinny winter rations. "Jim Harvey shot two elk from his saddle," Mike Norton proudly recalls of his grandfather as we look at a romantic image of Harvey on horseback. Nowadays, quotas limit use through the peak season. The National Park and Forest Service restrict horse traffic and campfires as well. Early Harvey and Norton history highlight a different time and place, when the remote reaches of Indian Peaks could still be reached by trusting a cowboy with a Winchester rifle to get you there and back safely. For Mike Norton, the water that drowned out his family's ranching history also floated Norton Marina. Going from ranching to the marina business may seem an odd transition, but Mike's family history shows how flexible they were! Frank Norton spent his early youth traveling with his father's tent show, Norton's comedians. "Dad had such funny stories about that," Mike says. When the traveling troupe era ended (talkies and the Great Depression meant "they didn't eat too well sometimes"), Frank Norton moved to Oklahoma with his father before finally joining his mother and Jim Harvey in Grand County. Regardless of his occupation, Frank Norton was a showman. Remarkable old photos save the rich history of pack trips into the Indian Peaks area, camp sites on the shores Lake Monarch and rich harvests of rainbow trout. But Frank Norton and his horse Oak rearing high like the lone ranger really show Frank Norton's flare and charisma. In many ways, Norton Marina continued the Circle H's heritage. Frank's marina included the Gangplank, a restaurant and dancehall that looked like a boat, with porthole windows and originally a rainbow trout aquarium for the bar. His admiral's hat, which Mike still has today, replaced his cowboy hat and a 25 foot Chris Craft named the Bonnie B replaced old Oak as his ride. More or less, this is the world in which Mike Norton grew up. Growing up Frank's son meant work too. "I was 8 or 10 years old" when we started "Norton's Ark," Mike smiles, referring to the Gangplank restaurant. It was the early fifties in Grand County. "What backhoe?" No bailouts either! "Those first few years, I nearly starved to death," Frank Norton once told a reporter. "But," he added, "every year the business kept growing and before I knew it we had a good marina going." Before it was over, Norton Marina fulfilled Frank's dream of a family business, only in "boating recreation" instead of ranching! "It wasn't all roses," Mike agrees. As a boy, Frank Norton went to military school. "They disciplined him and he used the same technique on his kids." Frank expected his kids to help and to obey his commands, without question. Using Tide and a G.I. scrub brush, Mike Norton recalls scrubbing lower units. They painted wooden boats in the wintertime in the shop. The kids came in from school, changed clothes and started working. "Dad and mom had a lot of kids cause they needed a crew!" Maybe his most memorable job was cleaning out the septic tanks for the cabins that his dad built to help offset the lack of income at a Rocky Mountain marina during winter. After digging up the lids, "dad would put a ladder into the septic tanks." Then, Mike crawled in and shoveled out the waste while his dad hoisted the buckets out. "I was so glad when Ernie Seipps started his septic clean out business," Mike says as we motor along beside Grand Elk Marina's covered docks on a pontoon boat. The hard work and experience at the marina paid off when Mike joined the military. Like so many of his generation, Mike received his notice to join ground forces in Vietnam. Luckily, about that time, Navy recruiters were in Granby. They showed a strong interest in a National Honors Society student who lived a life on water! The pieces of the puzzle fit, and "that got me in the Navy," says Mike with real appreciation. In 1973, the family tradition passed on to Mike and his brother Frank when they bought the marina business from their dad. A lifetime of experience came with them. But it took more than dock maintenance, boat service and customer service to run Norton Marina. And, as the brothers took over, the old Admiral Frank Norton stayed in the house he had built next door to the gangplank, insuring that his strong personality was never far away. Lots of obstacles exist for a marina on public lands. As Mike took over sole ownership from his brother, he also fought to bring the marina under the National Forest Service instead of the National Park Service, which effectively removed the "power of condemnation." "We had to fight for our livelihood," Mike explained when he sold the Marina in January of 1997. Mother Nature challenged the marina too. Ice might remain on the water for half of May. June snowstorms blow in monster clouds, as awe-inspiring as the calm sunsets. Freezing rain rips into all but the best prepared boaters nearly any time of year, and hailstorms can hit in a heartbeat. "We're like farmers in that way," Mike recalled. "Drought, winters, high water, low water, you can't really help, we understand that." On the other hand, the glassy waters of Lake Granby reflect the awe-inspiring Indian Peaks along the Continental Divide on calm, sunny days. Tourists and locals try their luck catching the Mackinaw that makes it attractive to sportsmen and women. Intrepid wake boarders mix with sweet sailboats against a beautiful background of rugged peaks that reach high above tree line. On those days, it's hard to think of a more spectacular place. Through it all, Mike Norton clearly enjoyed his life at Norton Marina. "I liked being out in the elements with the boating public." He also counts the independence of self-employment and the uniqueness of the marina as blessings in his "good life." Grand Elk runs the marina today (2009). Its operation rents out slips and moorings, daily pontoon boats and other related services. It's as beautiful as ever to peer across the lake at sunrise in August, and it's as cold and forbidding as ever when the winter winds whip across the thick ice an snow of the lake in January. Few wooden hulls appear during summer season as in the old days, but beautiful boats, both motor and sail, still surround the Marina. Yes, its original character remains, not far from the surface. The Gangplank changed its name to Mackinaws, where customers in the main room still look out portholes across the lake to the rugged outline of Indian Peaks Wilderness Area, although there is no longer as much space on the dance floor. Those familiar with Indian Peaks recognize old Abe Lincoln lying in his grave along the Continental divide, where Mike's early ranching family led pack trips and today can still be reached, albeit under more controlled circumstances. Today's anchored concrete docks and gas dock continue the process that started with Frank Norton using finger docks that Mike staked in the ground and an old chicken coup from the Circle H to fuel boats. And in all of Grand Elk Marina's features and history, Frank Norton and his family exist. In the house that they built on site where all of his children were photographed as they grew up and as they graduated from Middle Park High School. In the restaurant where Mike remembers finding the nerve to ask pretty young gals to dance. And, in the numerous family photos that show a smiling, handsome Frank Norton and his attractive family surrounded by high mountains, wooden Chris Craft and a sense of high expectations. Mike remembers his dad as the "greatest storyteller I've ever known," which he used to his advantage in all occupations. In 2001, I met Frank Norton, only once before he died the next year. He told us about the time Jim Harvey knocked the federal agent who came to tell take their land away to the floor, placed a foot on his chest and said, "If you get up, I'll knock you down again." We could see it happening as he told the story more than 50 years later. But the story continues beyond Frank Norton. From traveling tents shows to dude ranches to a forty-plus year family run marina, the Nortons made one of Grand County's most enduring "institutions." Entertaining, industrious, and life-loving, Mike simply says, "It's been a really good life." And that's a family tradition. The town of Tabernash was established in 1905 on the location of the old Junction Ranch. The name came from the Ute Indian, Tabernash, who was killed here in 1878 during a confrontation with a posse sent to stop the Indians from tearing down fences and racing their horses on the white mans newly "private" property. In 1913 the locomotive terminal was relocated from Fraser to Tabernash by the Denver and Salt Lake railroad. When the Moffat Tunnel was completed, the need for the terminal diminished, but the community persisted with a ranching economy. The prospect of discovering a remnant from a 10,000-year-old stone age society that inhabited Colorado's Middle Park so long ago seemed remote at best - while the suggestion that a prized Folsom point could somehow materialize before our very eyes appeared all but impossible. For one thing, it was the last day of excavating for the summer at the Barger Gulch archaeological site and the ten member scientific team would soon be packing up and heading back to their ivory towers at the University of Wyoming and the University of Arizona. Barger Gulch is a desolate spot that the federal Bureau of Land Management (BLM) oversees. It is hard, parched dirt dabbled with sagebrush as far as your eyes can see across the flat valley - a haven for all manner of bugs and other forms of native wildlife. In winter, the place turns to the opposite extreme as temperatures plunge to minus 40-degrees and howling winds whip up ghostly images of snow that swirl eerily across the land. This is Middle Park, a high mountain basin with roughly the same geo-political boundaries as Grand County. It encompasses some 1,100 square miles of unforgiving territory flanked on three sides by the formidable wall of the Continental Divide and its terrain soars high over the Great Plains into the thin, alpine air up to altitudes of 13,000 feet above sea level. What would induce these primitive Americans to trek all the way up here without so much as horses for transportation? How would they have survived the brutal winters with only primitive tools and clothing? And why in the world would they ever want to settle in such a barren, god-forsaken place as Barger Gulch? This site could well prove to be one of the most significant archaeological discoveries of its kind in North America, according to BLM officials who oversee the project here. In just three years of work in a relatively small excavation area, investigators unearthed more than 18,000 artifacts - a staggering number ten times that discovered at typical Folsom sites. And this is only one of four sites in the same vicinity. In addition to Barger Gulch and Upper Twin Mountain, discoveries include the Jerry Craig and Yarmony Pit House sites. Most of these were occupied by peoples described by archaeologists as Paleo-Indians, a catchall term for ancient humans that inhabited North America; Yarmony Pit House post dated Paleo-Indians by about 3,000 years. But long before Paleo-Indians ever set foot on the Continent, Middle Park was a prehistoric menagerie; 20-million years ago, it was the stomping grounds for prehistoric rhinoceros, three-toed horses, camels, giant beavers, and even small horses. Creatures known as oreodonts also romped across the mountainous terrain. These vegetarians, ranging in size from small dogs to large pigs, fed on grasses and green, leafy plants. In fact, the skull of one of these animals was discovered recently in the vicinity of Barger Gulch. These long extinct, hoofed animals resembled sheep, but were actually closer to camels, and were common in the western U.S. This latest discovery is remarkably well preserved; while the bones have turned to stone, the smooth, hard enamel that encased the animal's teeth is still intact. Humans arrived in North America much later - about 12,000 years ago - as the last Ice Age of the Pleistocene Epoch made its exit. These first Americans crossed a land bridge from Siberia to Alaska and began populating the entire Continent; experts believe it is possible they also arrived on boats following the Continental Shelf into North America. Folsom people are best known as nomadic, big game hunters who chiseled out their spear points and finished them off with a distinctive, artistic flourish - a unique groove, or flute, that runs lengthwise along the face that has become the symbol of this Paleo-Indian culture. They honed the tips of these primitive weapons surprisingly sharp for killing frenzies that were necessarily up close and personal: they herded their prey into traps before launching their spears - and archaeologists suspect there was just such a bison ambush site near Barger Gulch. The quarry just over the rise is a gold mine of raw materials, including fine-grained Kremmling chert and abundant Windy Ridge quartzite, which provided a never-ending supply of top grade stone. "It makes sense," explains Todd Surovell. "You would want to camp where you could get as many raw materials as possible within a short distance. That's where you're going to park yourself for awhile." The bulk of these tools originated with local material, but investigators have found some 200 "exotic" items noticeably out of place at Barger Gulch. One is a distinctive piece of yellow, petrified wood that came from 93 miles away as the crow flies, near the town of Castle Rock on the Colorado plains. Another is a large biface that was brought up from the Arkansas Valley, some 60 miles south. "They worked on it up here in one place and turned it into two, maybe three projectile points," notes Surovell. "One of them broke during manufacture and we have two pieces that fit exactly together." Fitting these and thousands of other pieces together is what archaeologists do when they get back to the lab. The process begins on site where investigators photograph each find and record its exact location within the excavation block. This gives the team a visual reference to help recognize activity patterns - a way to connect the dots of Folsom society. But the specks come to an abrupt stop, as if they suddenly run into a solid wall. "If we could figure out that this represented the wall of a structure, that would be really special," he explains. "Nobody's even been able to do that before in a site of this age in North America." Just then, a graduate student pops his head inside the door. "You want to be a camera man?" he asks Surrovell. "What do you got?" "A Folsom point," he replies with a broad grin. We rush over to the site where Waguespack has dug a narrow shaft down the north wall of the excavation pit and hit pay dirt - a Folsom point that remains half buried in the stratum of rich soil. The unrest and hard feelings between the Indians and settlers in Middle Park gave rise to an inevitable conflict the last week of August, 1878. About forty Utes, led by Piah and Washington, started to set up camp in William Cozens’ meadow, near Fraser, taking fence poles to make fires. Cozens drove them off, telling them to replace the poles and leave. The Utes moved down valley about five miles to a spring not far from Junction Ranch (named for the junction of the Rollins Pass and Berthoud Pass wagon roads). There, Johnson Turner, who leased that land, became increasingly uneasy as the Indians were drinking heavily and expressing anger that Ouray given away their land in treaties with the white man. They wanted Turner to pay them for the hay he was cutting. They tore down his fences for firewood, turned their 100 horses into his meadow, and set up camp. They also laid out a race track on drier ground about a mile way. Turner complained to the sheriff, Eugene Marker, who rounded up a posse of men, intending to remove the Indians or at least convince them to move on. Accompanying him, on September 1, were Frank Addison, a transient prospector, John Stokes, T.D. Livingston, and Frank Byers. The posse found only women and children at the camp, since the Ute men were at the race course. Marker, the sheriff, ordered the encampment searched for firearms and when the Ute men returned, an angry confrontation ensued. Tabernash and Frank Addison exchanged threats, and Tabernash jumped from his horse and snatched one of the guns piled on the ground. Frank Addison immediately shot him. Tabernash tried to pull his rifle from its scabbard, but that it became entangled, and Addison then fired twice more. Tabernash slumped over the neck of his pony, which ran away through the willows. Apparently Addison recognized Tabernash as the Indian responsible for the killing several of his companions while trapping furs on Grizzly Fork in North Park six years earlier. After this bloodshed, the posse persuaded the rest of the Utes to leave, after they buried Tabernash’s body in a shallow grave. No one was ever sure where Tabernash was buried. There was a rumor that the slain Tabernash was buried in a draw not far from Junction Ranch, but when the Grand County Historical Association excavated the site, nothing was found. A day later, September 3, on a Ranch near Kremmling, Abraham Elliott was shot while cutting wood, and his horses stolen. In response, the posse moved north in the direction of the White River Reservation. 60 Utes met the posse, and explained that the culprits were Piah and Washington, neither of whom was a part of the White River band. Ultimately, the Utes signed a council report, returned horses stolen from the Elliott ranch, while the ranchers returned guns confiscated from the Utes at Junction Ranch. The matter was considered legally settled, but outrage and fear continued among the settlers and the Utes of the area. In 1902, E.A. 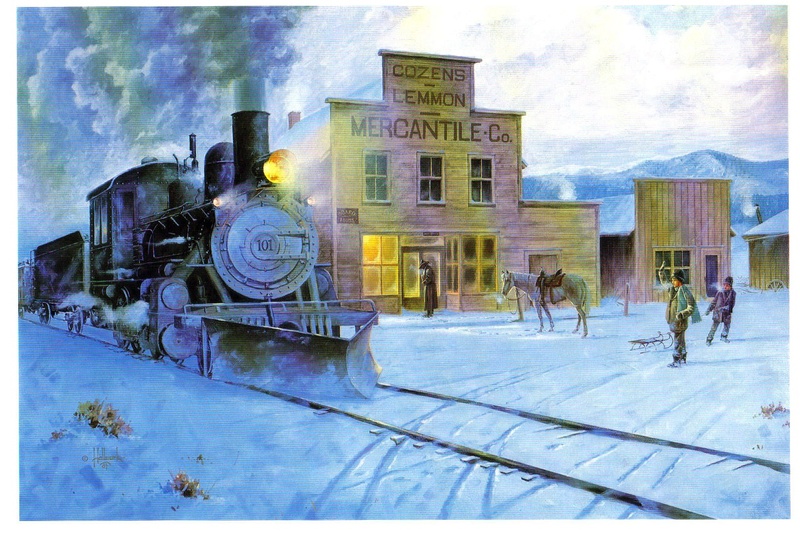 Meredith, chief engineer for the Denver & Salt Lake Railroad, named the town that had grown up with the building of the railroad, after the slain Ute, Tabernash. Captain John Charles Fremont was born in 1813 and at the age of 31, in June 1844, was exploring the northern reaches of the Republic of Texas when he passed through Grand County. This marked the first appearance of official government enterprise in Grand County. His expedition included some 40 explorers, including people of Creole, French, and Black descent. The guides were Thomas Fitzpatrick and Kit Carson. This expedition entered Grand County via Muddy Pass and exited via the Blue River, never traveling into the eastern part of the County. They met with some 200 Arapahoe Indians, who were traditionally suspicious of the intruders, but through the giving of trade gifts, overt conflicts were avoided. The cartographer for that expedition was Charles Preuss, who provided the first map on which all of the central Rocky Mountain Parks were named and mapped accurately. The first known white settlers came to Grand County about 1874 but there were no established churches for many years. The area even lacked circuit riders and camp meetings so typical of many other parts of the West. The first building used exclusively for a church was probably an Episcopal church in Grand Lake, erected in 1896, but used sporadically during summers only. An Arapahoe Indian who was an Episcopal priest held occasional services in that town. The First Congregational Church of Hot Sulphur Springs was dedicated in 1904 and other churches were also established about the same time in Kremmling and Fraser. Sunday School activities along with special holiday services and women’s activities seemed to be what provided continuity to worship efforts. Curiously, at one time a local newspaper carried weekly Sunday School lessons. A Greek Orthodox church was built in Hot Sulphur Springs for the many of that faith who visit there. A major growth spurt developed during the last quarter of the 1900’s when older buildings became overcrowded and residents, long-term and recent, decided to commit time and money to new church buildings. In 2004, 28 churches were listed in the telephone directory. One of the oldest brands in Colorado still in use by the same family is the Bar Double S brand of the Sheriff Ranch near Hot Sulphur Springs. The current owners of the ranch are John Brice and Ida Sheriff. In 1863, Matthew Sheriff of Keithsburg, Illinois came to Colorado to search for gold in the California Gulch, near where Leadville would be established. Mathew was dismayed by the gray mineral which consistently clogged the gold sluice, and gave up on his dreams of instant wealth to return to Illinois. Many other miners also gave up mining for this reason, never realizing that the gray mineral was carbonite of lead, which was rich in silver. Mathew died in 1863 at the age of 40, leaving behind his wife Marietta and their 3 surviving sons, Burt, Glenn and Mark. 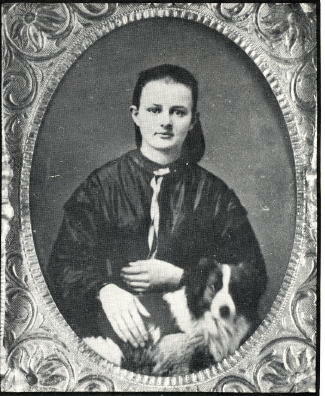 In 1878, Marietta was inspired to return to Colorado in search of security and stability for her family. She spent some time in Leadville running a boarding house. Her sister was the wife of William Byers who was developing the Hot Sulphur Springs area so Marietta moved to the area to settle with her sons. In 1882 the family homesteaded three ranches of 160 acres each, proving them up and added a preemption right to another 160 acres. 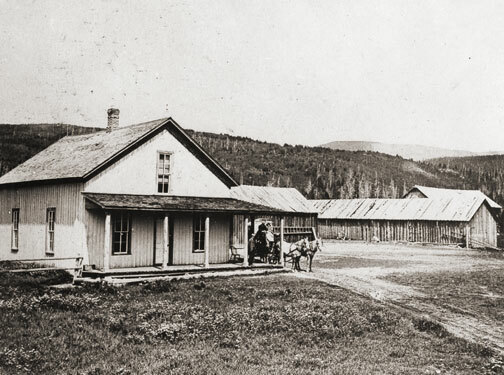 Bert later moved to Denver and established a livery stable and Mark and his mother moved into Hot Sulphur Springs, while Glenn continued to work the ranch. Glenn married Alice Cleora Smith in 1886 and they had two surviving sons, Brice and Glenn Jr. Glenn Jr. was only 6 weeks old when his father died at the age of 33 of "brain fever" or diphtheria. Alice took the children back to her family in Iowa to raise them, but the boys returned to their Colorado ranch in 1910. Brice, who suffered from a back injury as a child, bought an abstract business in Hot Sulphur Springs and lived there with his mother for the rest of their lives. Glenn Jr. continued to expand and develop the ranch and married Adaline Morgan in 1923. They had four children; Nona, John, Robert and Catherine. Glenn Jr. served Grand County as a Commissioner for 24 years and also as the County Assessor for 4 years. Glenn Jr.s, son John, took over the ranch and married Ida Marte in 1949. Ida's family had homesteaded their own ranch near Cottonwood Pass. They have two children and continue to work the ranch to this day. Born to a Wisconsin doctor in Chicago November 12, 1916 was one of seven skiing sons by the name of Stephen J. Bradley. His talents in skiing showed up at a very early age. By the time he was attending Dartmouth College his talents were apparent and was a top competitive skier. He skied in the slalom, downhill, jumping and langlauf while on the college's team. Steve then was called to serve his country during the World War II Army service. After his discharge he then attended and coached skiing at Colorado University. In 1950 Steve became Winter Park's executive director. During his employment at Winter Park he guided it from a four rope tow/three T-bar local ski area to a major resort of 770 acres with 13 chair lifts. His brilliance in design led to the Balcony House, the Base Lodge which was one of the first ski area structures to utilize solar heating, the restaurant in the midway proved to be a model for the "scramble" system of food service and then there's the Mary Jane section of Winter Park which was another one of his talents. Stephen was given the name "Father of Slope Grooming" in 1952 when he then invented the famous Bradley Packer-Grader when experimenting with slope grooming. The invention was a one man gravity-powered slope grooming device which revolutionized the ski maintenance industry. Nick-named "the Purple People Eater". This machine was a mogul-cutting snow groomer that was 5-foot-wide corrugated culvert that a skier would drag down hill or as they said " A hardy mountain crewman" who risked his life by being devoured by the spinning rotor. As skiing became more popular, skiers started demanding that the slopes be groomed. Nature was no problem but not everyone wanted to ski moguls. This Bradley Packer was a way to reduce the mogul's and keep snow on the trails by flattening the snow. "It was a pretty scary thing" supervisors claimed. Grooming was soon transferred to a line of tracked vehicles now known a "Snowcats". Stephen served as President of the NSAA (National Ski Areas Association) and helped organize Colorado Ski Country USA and the Colorado Passenger Tramway Safety Board before his death in Longmont November 13, 2002. You can find him as an honored member of the Colorado Ski Hall of Fame and in the National Ski Hall of Fame.